One of Dig Inn’s most beloved sides is our Mac & Cheese. Made with whole-wheat pasta, whole milk, and crispy panko breadcrumbs, it’s popular enough to sell 30,000 scoops per week. Clearly, the recipe didn’t need a makeover. But when Taylor Lanzet, Dig Inn’s Director of Supply & Sustainability, proposed a partnership with Jasper Hill Farm, who makes some of our all-time favorite cheeses, we couldn’t say no. Located in Vermont’s Northeast Kingdom, Jasper Hill raises two herds of Ayrshire cows, makes their own award-winning cheeses, and collaborates with local creameries to cave-age and sell their products. Partnering with Dig Inn would open up a larger market in NYC and Boston for this small farm. 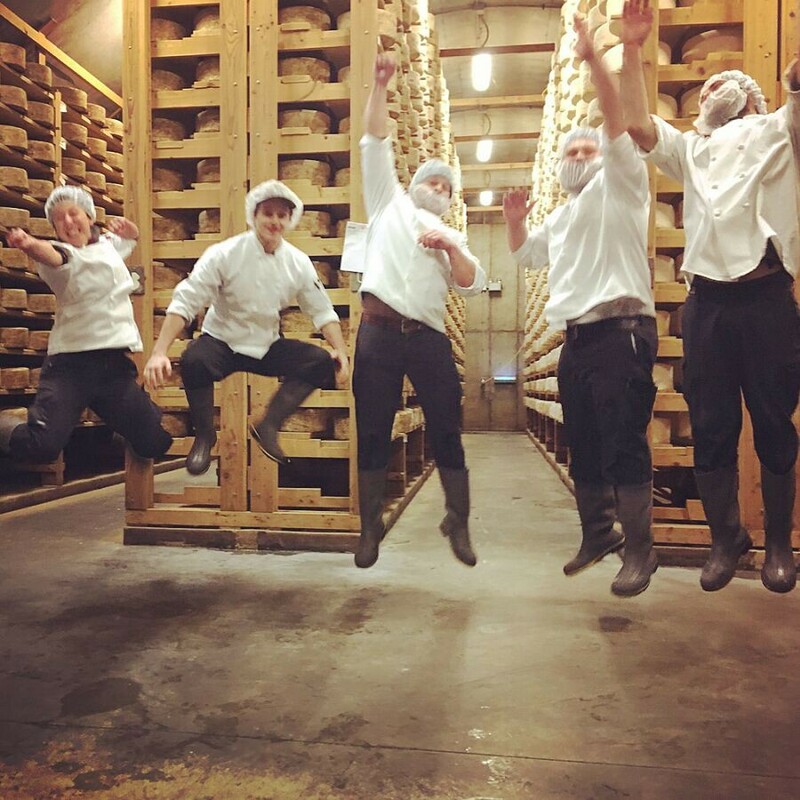 Once Jasper Hill jumped on board, Taylor began a year-long journey to find the perfect cheese for our Mac, working with Jasper Hill’s Sensory Team of cheese tasters — just one branch of their farm operation. Jasper Hill Farm was bought in 1998 by brothers Mateo and Andy Kehler, whose goal was to revive the working landscape of Vermont, which had been decimated by big dairy farms and industrial agriculture. They do this by pasture-raising cows, converting leftover whey into feed for heritage pigs, using compost to power their greenhouse, and creating incredible demand for farmstead cheeses made by small-scale producers. 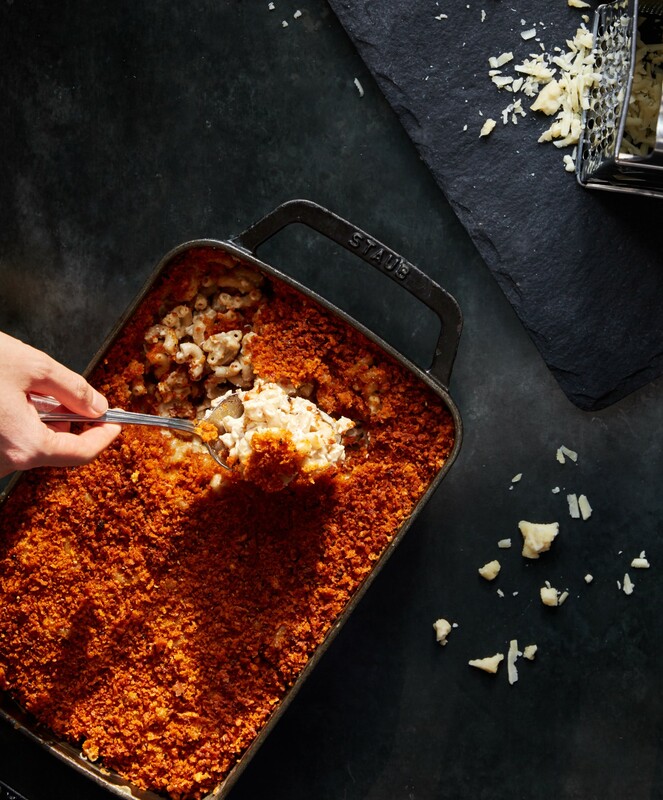 Dig Inn’s Mac & Cheese starts with a farmstead cheddar made with the same cultures as Jasper Hill’s acclaimed Cabot Clothbound. Aged for 12 months, our version tastes smoother and creamier than the Clothbound, making it perfect for Mac. Instead of shaping the cheese into a wheel, Jasper Hill shreds it, saving time, labor, and ultimately money. For a more accessible price, Dig Inn can purchase large volumes of Jasper Hill cheese. We mix it with mild Swiss and Fontal to boost gooeyness without overpowering the cheddar’s flavor. The final result? A sharper, meltier Mac that unanimously won a taste-test by Dig Inn chefs when pitted head-to-head against our old favorite. We sat down with Zoe Brickley, Jasper Hill’s Head of Development, to chat about creating the ideal blend of cheeses and her personal Jasper Hill pick (which you can eat with a spoon). Q: How did Jasper Hill decide on this particular cheddar for Dig Inn’s Mac & Cheese? A: Our Sensory Team hand-selected this cheddar, tasting each batch of cheese with a tool we call a “cheese trier.” It looks like a long, narrow apple corer, and it removes a tiny bit of cheese from each batch, so we can evaluate the five tastes: saltiness, sourness, sweetness, bitterness, and umami. Beyond taste, we’re looking for a complexity of aromas. The Dig Inn cheddar has notes of roasted nuts and chicken broth. We’re also looking for textural qualities. A lot of times, texture and taste are linked. 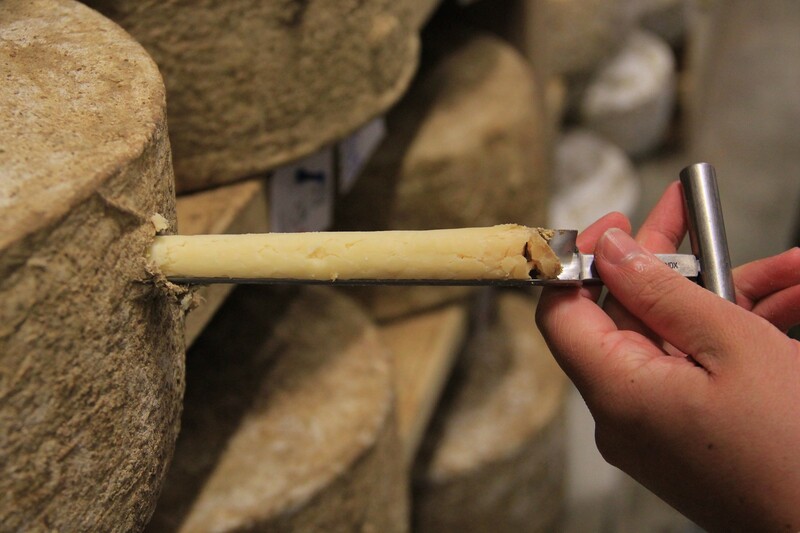 Well-balanced cheeses tend to have a really smooth texture, so that’s what we were looking for. Q: The Dig Inn cheddar is made from the same blend of cultures as Cabot Clothbound. Is there a difference in taste between the two cheeses? A: Old World cheddars tend to taste more horseradish-y, brooding, almost musty. The Clothbound is prepared in a traditional manner, wrapped in muslin and aged, but it has a little bit more sweetness, with some salted caramel on the finish. Dig Inn’s cheddar is unshaped and unwrapped. The process is less labor-intensive, making it a better value for culinary applications. Q: Why not use 100% cheddar for Mac & Cheese? A: Cheddar can be tough to cook with. It has amazing flavor, but sometimes, it’s not as melty or ooey-gooey as we’d like because of its crumbly texture. Swiss and Fontal are known for their melting qualities. Adding them to the Mac & Cheese means you get the sharpness of the cheddar and the meltiness of the other two. Q: Jasper Hill is a dairy farm, creamery, and cheese-aging facility. What’s the benefit of being all three? A: We use cheeses as tools for rural development. We partner with three other local creameries to develop our collection of 11 cheeses we produce together. This means each farmer doesn’t have to go out on their own, pound the pavement, and find opportunities to sell their cheese. We can do it as a team. Jasper Hill is unique in that we’re involved in all stages of the cheesemaking process, from raising cows to cave-aging. We want to develop new creameries where one or two cheeses are produced. This helps us keep control of the process because we’re obsessive about quality. Q: Besides cheddar, what’s your favorite Jasper Hill cheese? A: I love cheeses you can eat with a spoon, like Harbison or Winnimere. They’re both brie-style cheeses that are wrapped in bark from local spruce trees. The bark holds together the cheese as it ripens. When it’s ready to eat, you slice off the top and scoop it out. 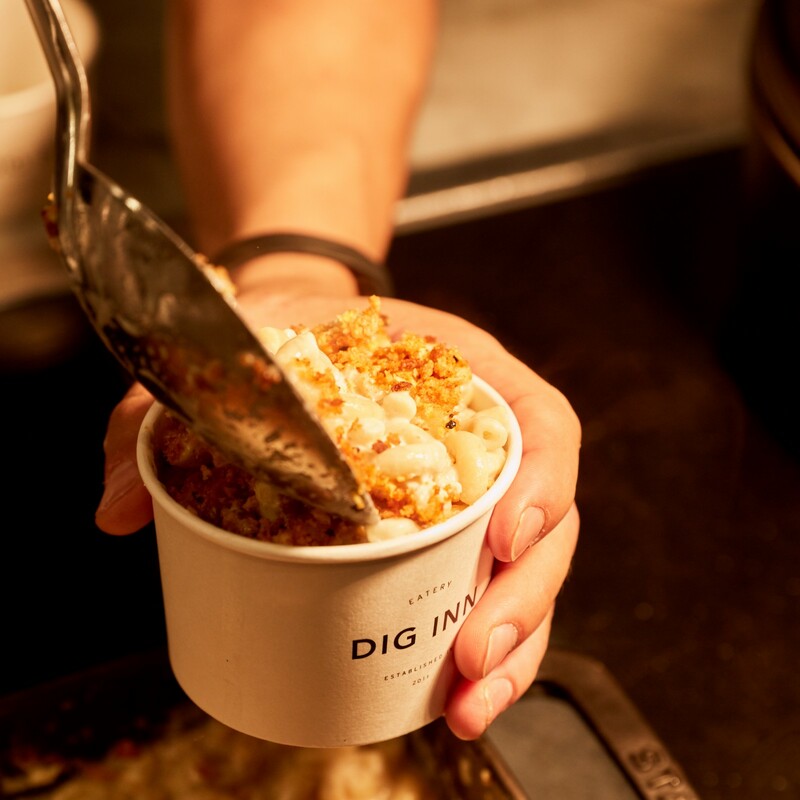 Q: Besides Mac & Cheese, what’s your favorite Dig Inn side? A: The Maple Cauliflower with Chickpea Crumble is delicious. I love that the cauliflower heads are roasted whole. It gives a great roasty flavor without the florets getting too soft, which can sometimes happen if you roast smaller bits.